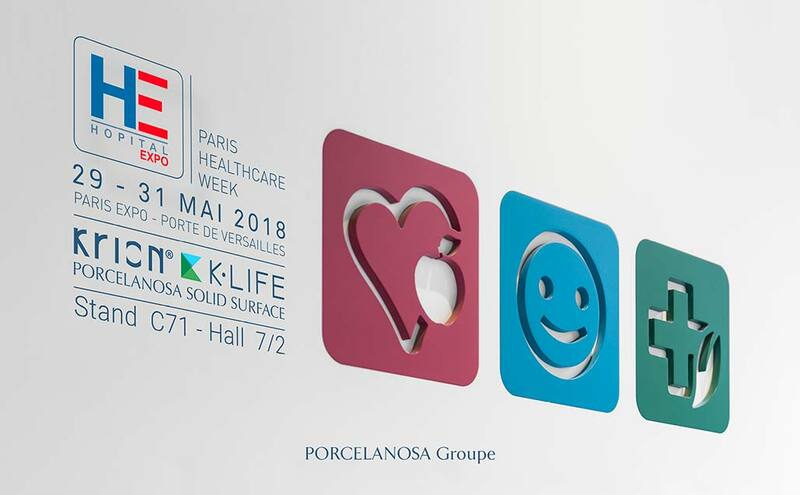 PORCELANOSA Group, with KRION Solid Surface, will once again be present at the Paris Healthcare Week trade fair from the 29th to the 31st of May. The quintessential trade fair of the healthcare sector gathers a broad spectrum of healthcare professionals, and construction and equipment specialists. The 2018 edition is dedicated to hospital architecture. Experts on the possibilities of KRION in the field of healthcare, PORCELANOSA Group will present its Solid Surface in a 54m2 stand, where the revolutionary technology of K-LIFE will appear prominently, in addition to the 15 new colours included in the Opale Series, with the possibility of backlighting. We will be waiting for you at Hopital Expo, Hall 7/2 Stand C71.